Did you know you can search online repositories and filter your papers library in much more powerful ways than you might think? The possibilities we describe below are available in both search mode but also in the regular library mode (collections, labels, authors, and sources) using the search field at the top (read until the end to learn more). Notice how the second token "2013" is automatically recognised as a year and receives the YR qualifier, this means that this query will search specifically for the year 2013, not the text 2013 in other metadata fields. This great improves the relevancy of results. Below we show how you can set these qualifiers yourself. Note also that by default tokens are separated by the AND operator. 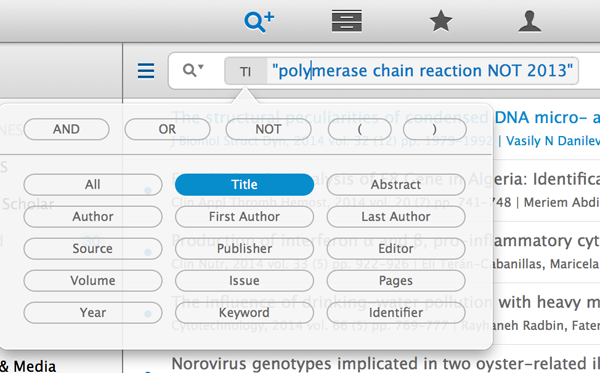 You can enter your queries in one go (e.g polymerase chain reaction AND 2013) and Papers will automatically split them into separate tokens. Again. the AND operator will be hidden after splitting the tokens as these are implicit. Note that sometimes Papers inserts these automatically, this is to remove any ambiguity in your query. For example, the query Blue AND Red OR Green can be interpreted in two ways: Blue AND (Red OR Green) or (Blue AND Red) OR Green. If its not clear from the input Papers will insert a default set of brackets to choose one of the variants. As shown above we support two formats, the google scholar format au:griekspoor and the pubmed syntax griekspoor[AU]. In both cases the au part indicates we want to search on author, and this is either prefixed with a colon or suffixed in between square brackets.